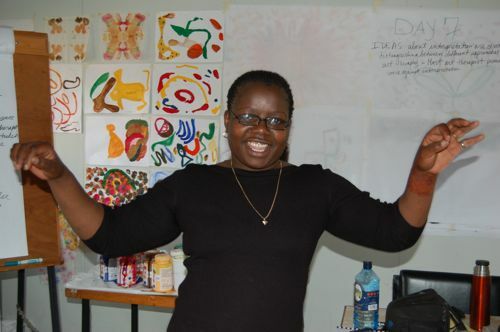 Harambee Arts staff member Kenn Rakwach teaches salsa dancing to children in the Kibera slum. Harambee Arts staff (Kenn Rakwach, Sofia Casas and Gloria Simoneaux) celebrate at the Havana Restaurant in Nairobi after the museum opening reception. We were HAPPY and PROUD!! !Kenn ate fajitas and had pina colada for the first time. Then we danced outside of the restaurant. Totally awesome celebration in honor of awesome children who have proved that they are capable of so much.